So it’s almost time to take the big test, and you feel confident that you are going to do well because you have studied and prepared for it. It took hours upon hours, but you took the time to read the entire textbook. Even though you knew it would take a vast amount of time, you created flashcards to help you memorize the information you read within the textbook. For days upon days, you labored to bring all things you thought would be on the test to memory, and finally the day of the big test arrives. You strolled to the test location with great confidence. No stress. No fear. ‘I’ve got this’ you said. You then take a seat and the big test begins. Although there were a few questions that stumped you, and one that brought you a little bit of stress, you whiz through the test with great confidence in your heart. Once completed, you picked up your test, and took it over to the proctor, and handed it over to be checked. Throughout our lifetime, we are going to experience many trials. Some will be minor, and some will be major. These trials are tests that are going to test our faith in Jesus. These trials are going to make us or break us. 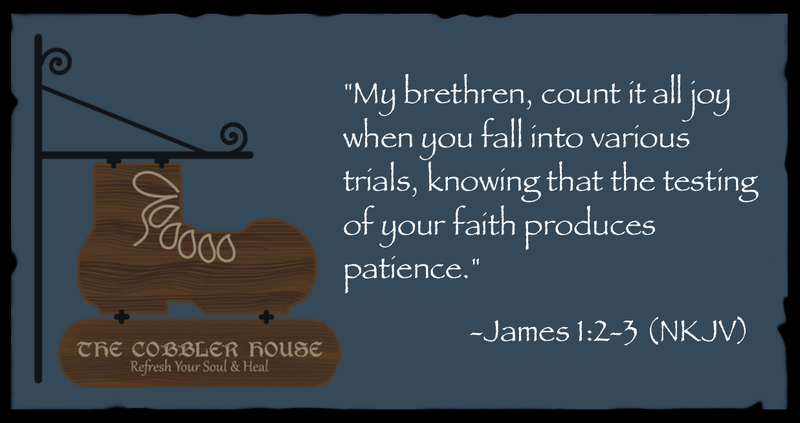 At the start of the book of James, the author encourages the believer to count it all joy whenever we fall into various trials. James tells the believer this because even as a believer trials are going to happen and he is encouraging us to prepare for them. As stated earlier, the trials you and I will experience are ones that are going to test our faith in Jesus. If the test is passed, then patience will come. Ultimately, this will prepare you for the next trial. The way to prepare for upcoming trials is to build a strong relationship with Jesus through fellowship with Him. This should be done on a daily basis. By praying1 (calling on Him) and reading His Word2 (the Bible). The aforementioned is having fellowship with God - you speak to Him (pray) and He speaks to you (reading the Bible). Spending time daily and throughout the day with the Lord will build up your relationship with Him. By applying3 what God has shown you into your daily life. Don’t simply obtain knowledge of what you’ve read in the Bible, apply what you’ve learned. For example, if you read “And be kind to one another, tenderhearted, forgiving one another, even as God in Christ forgave you.” (Ephesians 4:32 NKJV), then do what His word says - be kind, tenderhearted and forgiving to others. By placing scripture to memory4. Create a flashcard set with scripture on one side and the location of that scripture on the other side and begin to memorize it. (Hey why not, right? We want to pass the test.) This will prepare you to be able to recall scripture when you are caught without a Bible and facing a trial (test). By way of an established, solid, daily dose of fellowship with Jesus, you will not only have a great relationship with Him, but you will also have prepared for the trial that is to come. Then, with great confidence, you will be able to face that trial with joy and walk out of it in peace5 and a big smile giving praise to Jesus. If you have an encouraging scripture, please post it below!